Blueberry Coveralls adjustable diaper cover. Made in USA. Fit note from Karen: This is best from 4 or 5 months old or more. The fit is roomier than other one-size covers and it will still fit when other one-size covers have been outgrown. It is not cut for a very young baby. There is plenty of room inside this cover for adding extra absorbency when that is needed. Use it for daytime or nighttime. This is like the Capri Cover size One-Size except it does not have the inner stay-put flaps. Wipe-clean interior. No inner flaps (the Blueberry Capri Cover is similar but has inner flaps). It does have leg gussets. There are 3 rise adjustments. Polyester with polyurethane laminate (TPU). Made in USA. Don't worry about the tag names that you can read in the pictures. We use the same picture of the outside for both Capri and Coveralls. You will get what you order so disregard the tags that you can read in the pictures. They look exactly the same from the outside except for the tag name. 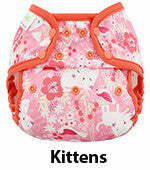 This is an adjustable diaper cover for use with your favorite prefold, flat, fitted or contoured diapers. It uses a lightweight and waterproof fabric with a laminated interior that can easily be wiped clean/dry and re-used. Latex-free elastic covered by soft bindings. The sizes and styling are the same except that Capri has the inner stay-put flaps; the Coveralls do not have that. Made in USA. I love the blueberry coveralls fit with the correct insert. And my son loves the vibrant design on them also which makes it extra wonderful. Blueberry Coveralls are so worth the investment. They do run a little large so will probably fit for a bit longer than most brands out there. I ended up getting two of the kitties print because my dd loves cats. I had never owned this brand until recently but they are quickly becoming a favorite brand for covers. This is my third purchase of Blueberry Coveralls and they are fantastic! I would highly recommend this product. My daughter has worn Capri & Coveralls products. I definitely prefer the Coveralls brand as my baby grows & becomes older. You will not regret this purchase!! I love my blueberry coveralls especially over my muslin flats. They fit my 2-month old and my two year old equally well. I can feel the quality of this cover and it is the bulk of my stash now. GMD was quick and efficient to get my order out.